Many auto enthusiasts would love to be able to drive a racecar on the open road. One reason they don’t is that such cars tend to be incredibly hot, loud, stiff, and uncomfortable. 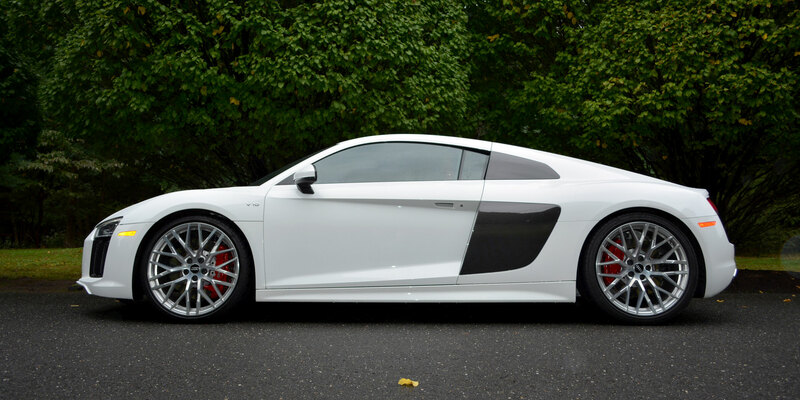 None of those adjectives, however, apply to the new R8 V10 from Audi. The company knows a lot about racecars, having won the fabled 24 Hours of Le Mans endurance competition 13 times since 2000. And Quattro GmbH—the Audi subsidiary that specializes in high-end performance cars—knows a good deal about building autos that borrow from that racing knowledge. With the newest R8, Quattro GmbH has brought its best engineering to the table to make a racecar that you can comfortably drive on the open road. 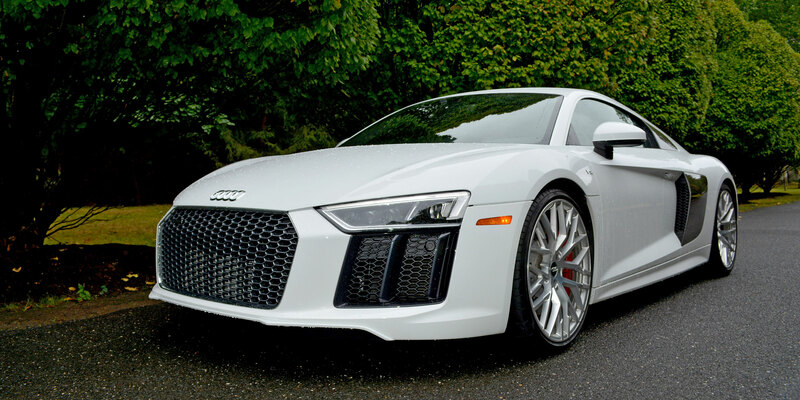 The 2017 R8 V10 is the second generation of the model, which debuted in 2007. The new edition clearly evolved from the original, and that’s good news. The 2017 version is slightly wider but about 15 percent lighter with a 3,649-pound curb weight. Audi’s design team accomplished this by extensive use of carbon fiber and aluminum in the space-frame chassis. Walking around the car, you’ll see much to admire. 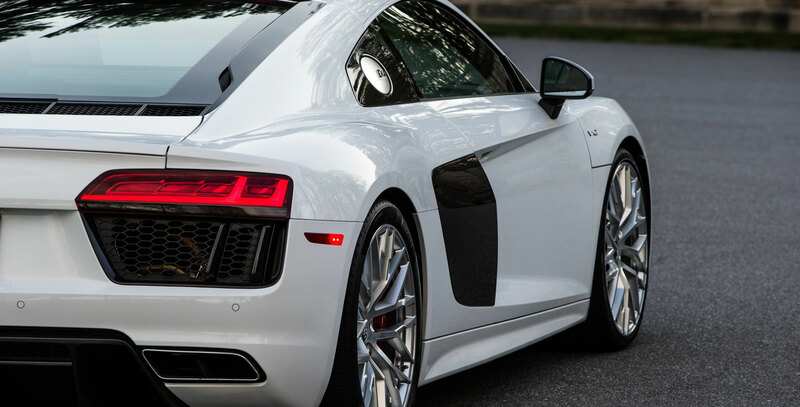 The styling is sharper, and the bodywork seems more tightly wrapped around the chassis than it was on the earlier R8. Audi has replaced the original model’s trademark side blade with a two-piece design, and the carbon fiber used on these side scoops adds a high-tech textural element. The low roofline trails over the mid-mounted, naturally aspirated (non-turbocharged), high-revving 540-hp, 5.2-liter V10 engine, the centerpiece of this car, and it is proudly displayed under the rear glass. In case 540 hp isn’t enough for you, Audi offers the V10 Plus model with 610 hp among its other track-focused enhancements. This engine, and lots of the car’s other mechanical elements, can also be found in the Lamborghini Huracan, the R8’s VW Group sister. Pressing the red start button on the steering wheel sparks the engine to life with a sharp bark, after which it settles into a menacing idle. We roll off, and once the engine warms up, I select Dynamic mode on the Drive Select menu. The exhaust opens up with a growl, and the seven-speed, dual-clutch S-Tronic gearbox changes down a couple of ratios to bring the engine’s revs up. Suddenly, the active magnetic ride suspension stiffens, and the steering ratio tightens. Cruising on a damp open road, I accelerate hard and the Quattro all-wheel-drive system immediately sorts out the road surface, gripping almost magically without any wheelspin as we rocket forward. An exciting mechanical symphony of growing intensity emanates from behind me as we quickly approach the incredible 8,700-rpm redline of the V10. I rapidly select the next gear and then the next, using the steering-wheel-mounted paddle, and the shifts are fired off in a seamless 120 milliseconds—simply staggering. The world has quickly become a blur. I get on the massive brakes, setting up for a rapidly approaching corner. As I downshift, the gearbox reacts instantly, blipping the throttle to match revs, and the exhaust crackles, feeling racy indeed. I turn in, and while there isn’t an abundance of feeling from the electric rack, the steering is nearly telepathic in its responsiveness. The car corners flatly, and I open the throttle once again, pinning my passenger and myself into our seats. Awesome. The new R8 is a technological showpiece for Audi. This is a supercar that delivers ultimate performance with ease and inspires the driver to explore its potential. However, you do have a margin of safety thanks to the array of electronic chassis systems. Unfortunately, the new R8 does not retain the previous generation’s old-school, gated six-speed manual gearbox as an option. I would appreciate a three-pedal manual gearbox option, because it would provide another layer of engagement, even at low speeds, but I can’t deny that the S-Tronic gearbox is amazing and would be unbeatable on the track. Countering the temptation of driving like a Le Mans hero on the way to the office, with Comfort mode selected and cruising at partial throttle, you’d almost forget that you’re piloting a machine that can rocket to 60 mph in 3.5 seconds and can go 199 mph. The exhaust system is relatively quiet, and most of the sound that you hear comes from the tires. The suspension is supple, taking bumps and rough surfaces without jarring. The gearbox automatically and imperceptibly shifts up at low revs, providing a driving experience that is peaceful and refined. You could drive this car every day, and certainly take your spouse on a relaxing weekend getaway in complete luxury, as long as you go easy on the luggage. On those long trips, you’ll appreciate why Audi has earned a reputation for great interiors. Our car has a tasteful sprinkling of carbon-fiber trim, but the red nappa leather in the spacious interior is the most striking element. The diamond stitching on the seats adds to the variety of textures and shapes, and there’s just the right amount of red to not feel overwhelming. The red leather contrasts nicely with the anthracite leather used on the dashboard and the Alcantara headliner, which shares the diamond-stitch motif. Though I’m six-foot-three, I have room to spare. As you’d expect, the 18-way seats have myriad adjustments, including bolstering, thigh support, and lumbar, so you can find the perfect driving position. There are no screens in the center of the dashboard, which is refreshing. 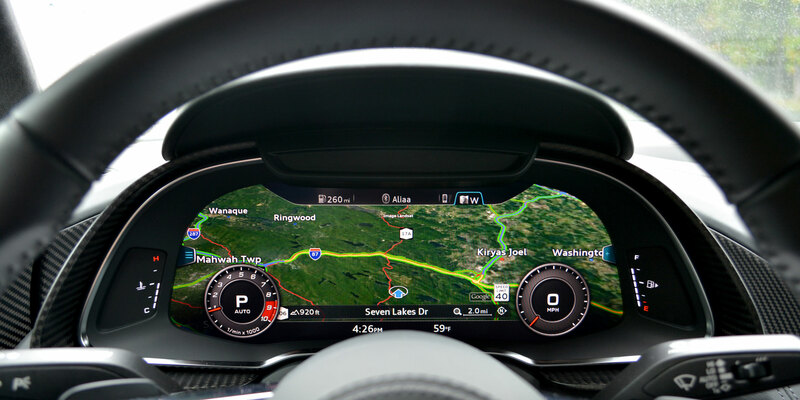 I’m a traditionalist who loves analog gauges, but Audi has done a good job here, placing all the relevant information in one central location on the highly configurable 12.3-inch Virtual Cockpit screen ahead of the driver. My favorite function is the selectable full-screen Google Maps layout, which may help you to anticipate corners while traveling at the pace that this car is capable of. If you’re considering an R8, you’ll inevitably compare it with the venerable Porsche 911 Turbo, which is another all-wheel-drive supercar known for its usability for daily transport. Without getting into the weeds in comparing the cars, you have the choice between an ultramodern exotic with a mid-mounted, high-revving naturally aspirated V10 engine and the classic lines and heritage of the rear-engine turbocharged flat-six 911.